Yes, there is kind of a rivalry between SF and Seattle, one that the Seattleites do not want to acknowledge (also maybe because Seattle is much more peripheral and provincial). Here comes a new article from the Economist that provides a different view: the 2 hubs are actually conv erging, because of the exchange of capital, brainware and people. There are 25+ flights daily between SFO and SEA, 10+ between SEA and SJC, 10 between Oakland and SEA. Can you figure how many people daily that means? 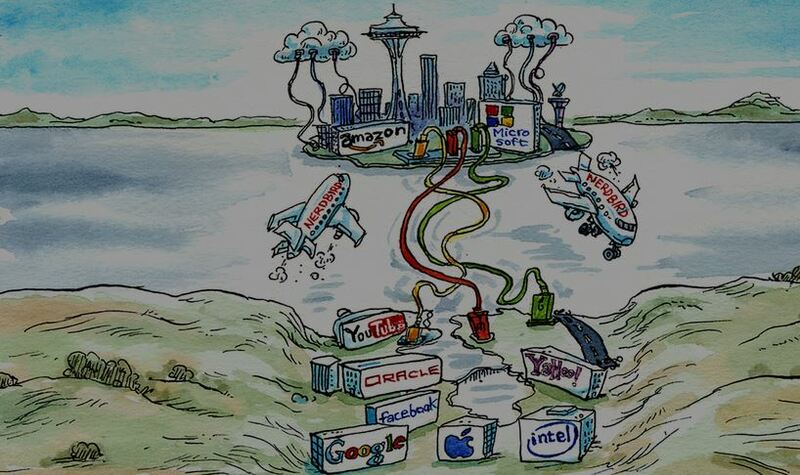 Seattle and Silicon Valley are now joined at the hip. The best approach is to make that connection as efficient as possible, says Rich Barton, a serial entrepreneur. He not only started Zillow and Expedia, a giant online travel site, among other Seattle firms, but is a partner at Benchmark, a leading VC firm in the valley. Nice comments from Microsoft M&A Exec Bob Kelly at the last Mile9 cohort graduation event: “Here’s the ‘dirty secret’ about Silicon Valley, and why Seattle startups have an advantage”. Bob Kelly arguments that Silicon Valley startups typically gain early sales momentum because they sell to other startup or mid-tier companies in the Valley. But in Seattle — which lacks that sort of dynamic startup ecosystem and robust buying and selling environment —startups need to find real customers who fork out cash because the technology solves a real problem. You get a different kind of company coming out of Seattle. The flip side of that is that the Valley tends to create companies forged with entrepreneurs who have “a bit more of the killer instinct,” while “Seattle is just so nice,” said Kelly. Nice and better founded? maybe. 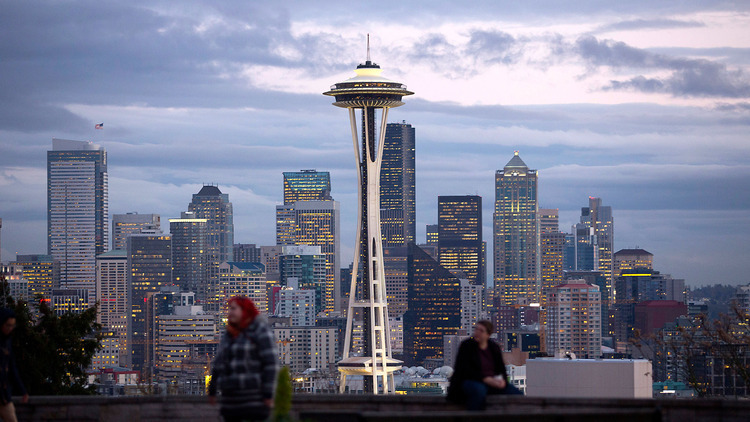 Again, Seattle is at the top in the ranking for tech cities in America. A new article from Bloomberg, based on the 2014 data from the U.S. Bureau of Economic Analysis, shows San Jose (eg the Silicon Valley) as the top city, followed by Bridgeport CT, then SF and Seattle. More than the ranking per se, it is the overall growth of the West (including Portland, LA, SLC and Denver) that is interesting. As well as how growth is even accelerating in some of these metro areas. 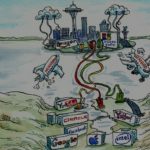 That is where Seattle is definitely showing its muscle: the number of tech ventures that are growing around the usual suspects (Microsoft, Amazon, and now Tableau, Expedia, Inrix, Parallels, Concur, Apptio…) is abundant and covers some of the most fun new tech areas (cloud, IoT, etc.). And yes, this will lead to population growth, traffic, increase in real estate values, all good problems to tackle. And technology will hopefully help in addressing them! You may want to read this article, where Ryan Sarver (previous platform guru @Twitter and other) describes his transition from being a startupper to a VC, and what difference it makes in the perspective of risk, time, success factors. The reason this is important if you are on the startup front is because you have to think in this terms to optimize your value story, and determine what are the most relevant components of your idea; how a balanced, well thought approach provides a better assessment of a business idea. Put your innate optimism away, look at your plan critically, attack it from various angles. And if it stands all your critics and doubts, be proud, just make the best presentation ever! smart cities find ways to become more efficient, to deliver more services via mobile technology, to optimize existing infrastructure, and to leverage citizen participation to create better land-use decisions and to break down bureaucracy in order to stimulate a creative, entrepreneurial economy. In short, smart cities are innovative cities. Yes, I think that ranking them year after year, as if incredible changes affect them so often, it’s a bit of stretch; but it is interesting to read the reasons behind, and check how comes that Seattle ranks #1 in North America. 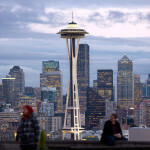 Seattle (..) is also a quality hub for startups and is one of the only North American cities with more than 1,000 open data sets which are offered for transparency but also to support the growth of startups and introduction of mobile apps to improve mobility and quality of life in the city. In the 2012 publication of the Global Startup Ecosystem Index, Seattle’s entrepreneurial ecosystem was ranked fourth in the world. Tableau (DATA) is top on the economic news these days, thanks to the great success of its IPO, that even few days after keeps humming at +75% vs. the initial offering price – kudos! 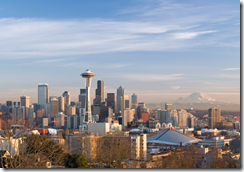 Well, ten years ago Tableau’s founders decided they needed a change of scenery and chose the “mountains and salmon and coffee and rain” of Seattle, in what CEO Christian Chabot has called one of the best decisions the company has made. This is an unequivocal endorsement of the Seattle area as a place to build technology companies in general, and of the region’s leadership in big data (as well as cloud, mobile apps, gaming…). Two things then: a great pool of talents, and a culture for innovation that is facilitated by a higher than average adoption of technology. Once again, an article describes that Seattle and its tech start ups are alive and kicking, and driving innovation and economic growth. 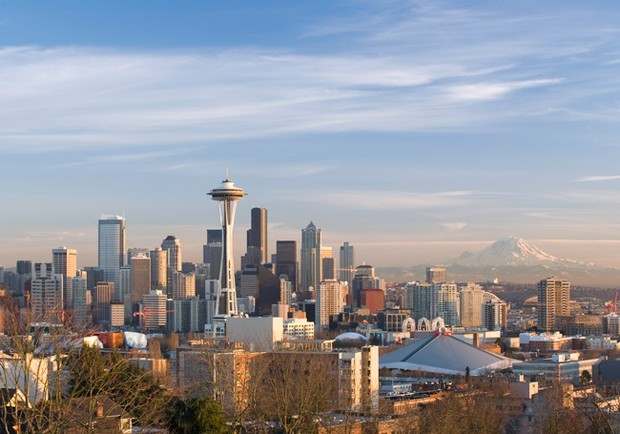 In Seattle there is a very interesting and different situation, since the specific areas of start up focus (namely, cloud computing, biotech, mobile) make for a healthy and growing ecosystem, and capital aligns better with their opportunities and timeline. What is definitely sure is that the sentiment of most people in the tech space is positive to excited, the rate of companies looking for hiring folks is increasing, Microsoft says they cannot hire fast enough for the new job openings, Amazon is planning to break ground on the 3 towers for its new HQ next to Lake Union. This looks all positive, and helps a bunch in these months of wintery gloomy weather! This is the news that Forbes publishes, based on high-tech employment data collected from EMSI and charted by the Praxis Strategy Group. The study articulates how this is the product of long- and short-term jobs generated by the local powerhouses: Microsoft, Amazon, Boeing. Well, Microsoft is still hiring, even if they are reshuffling their workforce more often now then ever, and they lay off more and more people as the product of a HR process. But the number of jobs at Amazon, or all other growing gaming, mobile, biotech, cloud computing companies is now growing with increasing speed, and their total number is amazing. More than other, the vibe is good. The Microsoft Partner Program (MPN – PartnerNetwork now) has its cycles and now, as any other year, all partners are asked to check and renew their credentials; see here the support plan from the Partner Team to help out partners in need. Given the impact of the cloud and the business transformation it necessarily drives (yes, I am talking again of the cloud and its opportunity, see the recent study from Unisys if you wish to gauge how important it can be for you) – shouldn’t they help you more in addressing the challenge at hand? A new and updated report on Tax Revenues has been published from OECD. Definitely, taxes are not the same for everyone!